Protective Covenants: Lakeview Forest Estates Landowners Association. 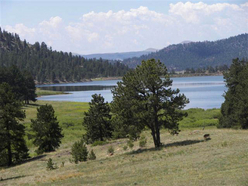 Common Areas include 175 acres of recreational land and easement along Fourmile Creek for fishing. Gated. Promise Land Ranch is an exclusive 54.25 acre recreational mountain property situated near a stocked fishing lake with a year round trout stream and 175 acres of private common area for hiking, hunting and equestrian use. This exquisite ranch offers stunning views of the Colorado Rocky Mountains and provides a sanctuary for abundant wild life such as deer, elk, eagles blue heron and other waterfowl. 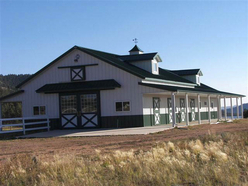 Improvements include a fully finished 36' x 82' Morton Barn with 4 horse stalls, tack area and feed room PLUS private living quarters. The living area includes a great room with gas fireplace, kitchen, master bedroom and bath. An interior adjoining door opens to the barn for easy access. The living area is located on the south side of the building with incredible views of the lake. The entire property is fenced with separate pastures for your livestock. A unique building site for the main home is located on a plateau over looking the stream and the lake. There are underground utilities in place, a high production well, oversized septic and to start your construction. Promise Land Ranch is "As Close To Heaven As It Gets"!